Assembled for the first time anywhere with complete Avengeance! 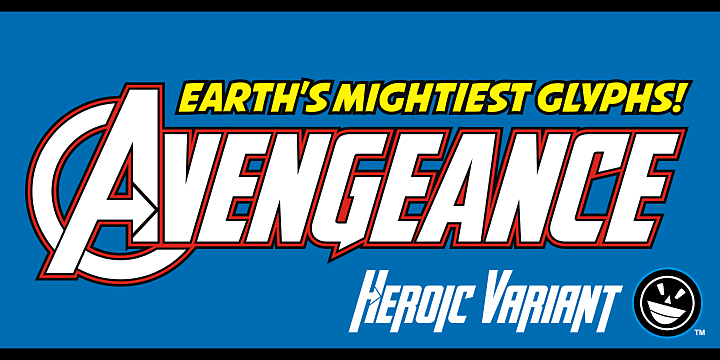 Welcome to the newest addition to the Avengeance font family: HEROIC AVENGER. Gather your team of avengers and craft the mightiest logo on earth with a collection of the most powerful glyphs in existence. The HEROIC variant of Avengeance will give you incredible results. Switch between normal, italic, bold and bold italic for mind-shattering results. No time for puny layouts. Grab a hammer and smack these letters around until the results are golden. Smack them a little harder and you might just see stars--or is that an arrow? Is that a giant man in red underwear? I can't say. There’s a wasp buzzing in my ear. But alas, let no trickster delay thee. The power to craft a proud statement of graphic import is finally at hand. But first you'll need to visit the website listed below and download my PDF KEYMAP, because some assembly is definitely required.